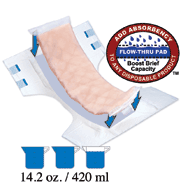 Tranquility Booster Pad 15" L x 4.25" W.
TopLiner booster pads are designed as flow-through pads that fill to capacity then pass additional fluid to the primary undergarment economically extending the use of any disposable brief or undergarment. They improve wearing comfort by ending leakage, rashes, and nighttime changes. The super booster pad nestles between inner leg cuffs boosting absorbency and helping to prevent leakage.